The unrestricted, intermediate speedways will dominate the schedule for a while. 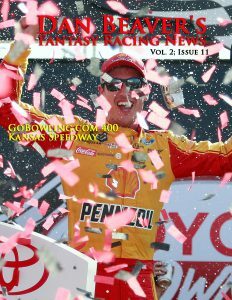 After this week’s GoBowling.com 400 at Kansas Speedway, the series heads home for the All-star race at Charlotte Motor Speedway and then the World 600. Two weeks after that, they challenge to unique Pocono Raceway and then head to another similarly-configured two mile track: Michigan International Speedway. Horsepower and handling are going to be the keys to success until the series visits back-to-back wild card tracks this summer. Sonoma Raceway and Daytona International Speedway will give players an opportunity to shakeup their roster, but until then, a lot of the same cast of characters will be featured each week. That is largely what happened at the beginning of this season when Kyle Larson, Chase Elliott, Brad Keselowski, and Joey Logano found their momentum at Atlanta Motor Speedway through Auto Club Speedway before the short track season began at Martinsville Speedway. Since then, the streaks have been broken up. Currently, Ricky Stenhouse Jr. has the best active string with three top-10s and five top-15s. On cannot automatically assume that the strongest drivers before this current spate of short track and the superspeedway offerings will pick up where they left off. In fact, one or two of them probably will not. The best guess is that the drivers with the least experience are the most likely to fall off, but Larson and Elliott have the added benefit of “the changing of the guard.” It is not as if the competition level has decreased, but several marquee drivers who stood in their way over last year are no longer in the equation while they have taken their place. Maturity and potential are not the same thing, however, so be cautious.